1.3. This competition is operated by Nestle South Africa (Proprietary) Limited (“Nestlé”) in conjunction with ColonyHQ (the “Promoters”). The Competition shall commence on 1 April 2018 and will end on 30 April 2018. No entries received after 30 April 2018 will be considered. 4.1. Purchase any Nestlé Participating Product and Ouma Rusk Participating Product, dial *120*5546# and follow the prompts for qualifying questions which will include entering the last four digits of the barcode found on the product packaging of each of the participating products, an ID number (or part thereof) and answers to simple questions about the participant or his/ her family. Keep proof of purchase in order to be able to redeem prize. 4.4. Winners will be determined by random draw that will be held on 1 May 2018. 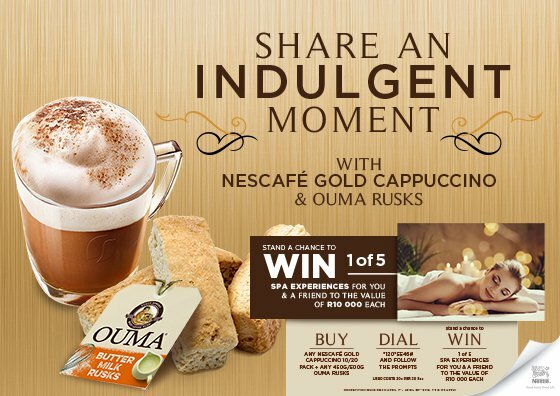 Participants in this Competition stand a chance to win 1 of 5 spa experiences for 2 valued at R10,000 each. The prize does not include any transport costs to and from the venue. 6.4. Prepaid spa vouchers will be emailed to the winners as soon as they have submitted the required validation documents and been confirmed as a winner. Winners can contact the spa directly to redeem their prize by making a booking at the relevant spa.